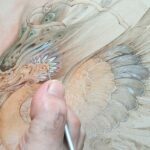 Azimi says he found it too challenging to put up with the difficult conditions at first, but with every passing day, he got better at using his toes to write and draw. 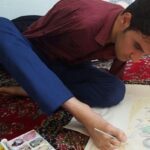 Rahim Azimi is a disabled Iranian artist in her early twenties who has lost his arms to an accident when he was only 10 years old. 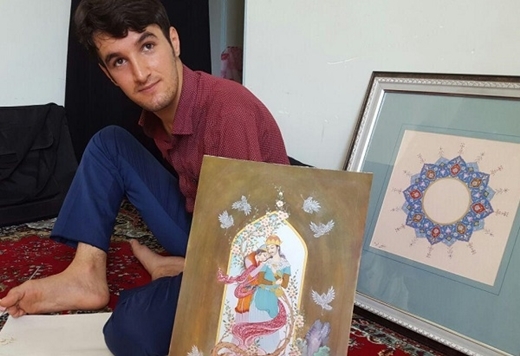 What makes the works of this young artist, who hails from Azerbaijan Province, distinguishable is that he just uses his feet to draw and paint. Pencils, paintbrushes, palettes and pieces of paper are strewn on the floor of his room which resembles an art gallery. In the corner, stands a small wardrobe where he keeps his citations and awards. 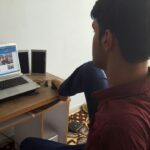 When asked about how he started using his feet to replace his hands in taking care of daily chores, Azimi said, “I was interested in education, so I decided to write with my feet. After practicing for a few months, I finally succeeded in writing with my toes. Azimi described reliance on God, perseverance and his interest in drawing as the three factors contributing to his success. 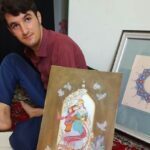 On top of painting, Rahim can turn over the pages of newspapers on his own; he operates a finger-touch smartphone and a personal computer as well.